When all else fails, there’s always curry to fall back on. 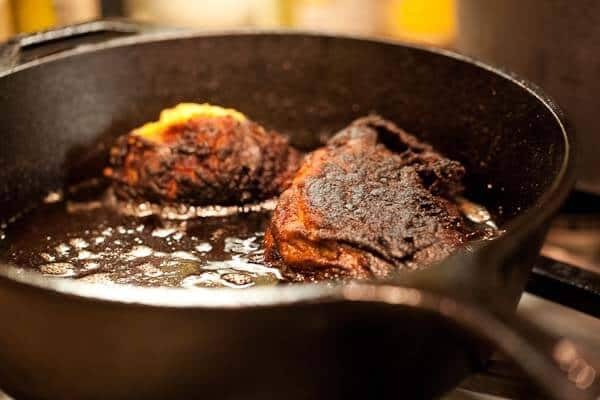 Despite all the beautiful food you see on this blog, I do have my share of kitchen disasters (that blob of charcoal was supposed to be fried chicken). 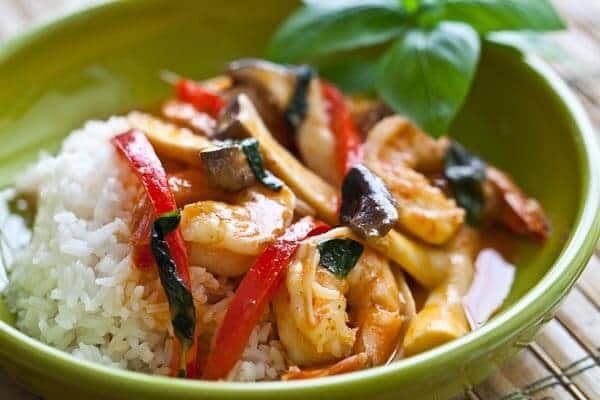 Thai curry is my “break in case of emergency” meal – as I always have a can of coconut milk, a can of curry paste, shrimp in the freezer and miscellaneous vegetables in the refrigerator. 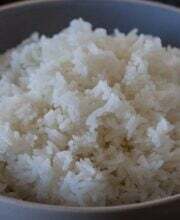 Rice is only a one-finger trigger button away or already cooked, stored in the freezer. Thai curry: Comes in a can (like above), a plastic tub or envelope packet. If you buy a big tub of it, you can store unused portion in refrigerator for a few months. But I prefer to get the small cans. Coconut milk: Which is not coco-loco (used for cocktails). Look in the Asian aisle of supermarket. If there are many different brands, shake the cans. The ones that sounds watery will be…well…watery and tasteless. Go for the cans that sounds like its full of thick liquid. Shrimp: Tail on or off, up to you. Vegetables: Bell peppers and fresh basil leaves (not pictured) – you can use Thai basil if you have, or just regular sweet basil is fine too. Step 1: You’ll want to cook the curry paste just a bit, just to release the oils and the flavors. The amount of curry paste you use is totally up to you (and you can always add more in later after tasting the curry). 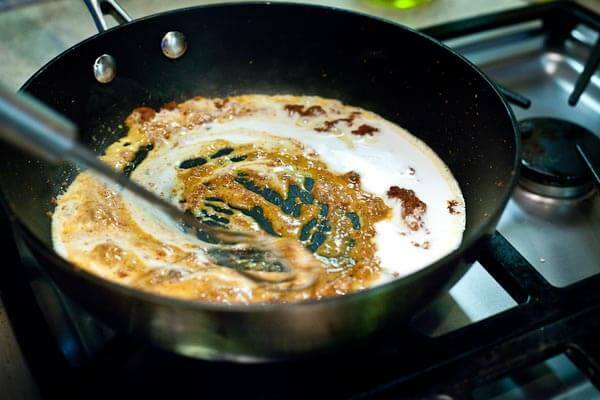 Step 2: Now pour in the coconut milk and whisk to incorporate the curry. This helps the curry paste break down and become smooth. Step 3: add in the vegetables to cook for a couple of minutes. At this point, taste the curry, and if you want it more spicy, then whisk in additional curry paste. Step 4: Now for the shrimp. cook until shrimp is cooked through. Step 5: Throw in the basil leaves, stir and you’re done. 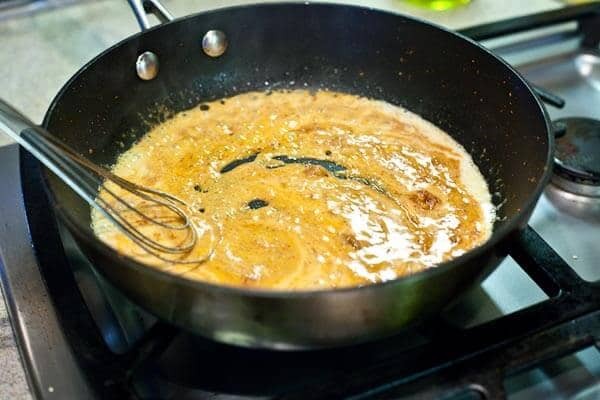 Heat a skillet over medium high heat, once hot add in the cooking oil and red curry paste. 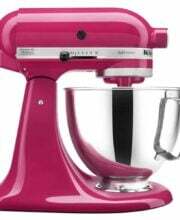 Whisk for about 30 seconds. Pour in the coconut milk and whisk to combine. 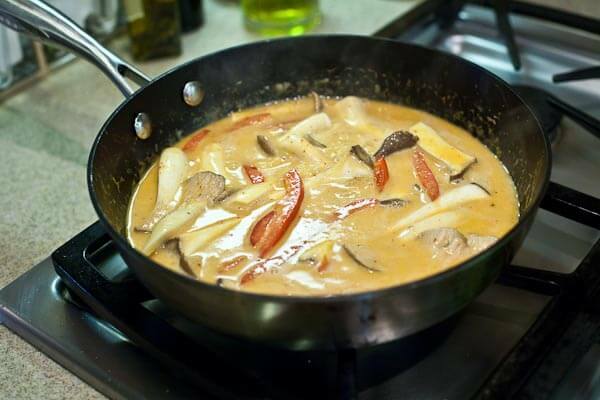 When it comes to a simmer, add in the mushrooms and the red peppers and continue cooking for 3 minutes. Taste and whisk in additional curry paste if you want. 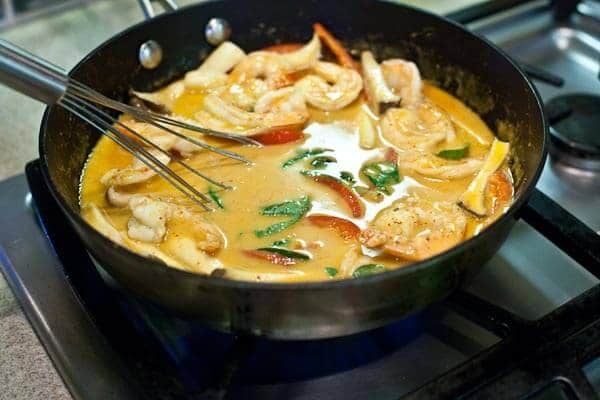 Add the shrimp to the curry and cook for another 2-3 minutes, until the shrimp is cooked through. 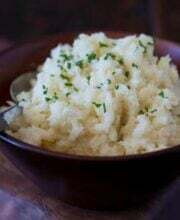 Stir in the basil and serve over rice. I have made this for my husband and have made it for dinner parties. Always a hit. We love it! 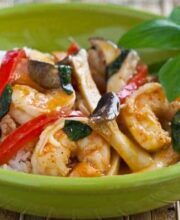 Great recipe…using the basic, I add toasted cashews, fresh pineapple, shrimp or chicken. Also seedless cucumbers, toasted peanuts, chicken strips and green onion. The idea is the basic sauce and you add what your taste buds are hungry for. Imagination is wonderful to use when cooking. This was delicious. I used shitake mushrooms, which I really love. I’m interested n trying the authentic thai recipe that someone else mentioned. I’d also like to try this with halibut. That too would be fantastic with the curry. I am going to try this but I was wondering if I could change the shrimp for chicken. If so, would I cook it in the same way? I know the chicken would take longer but how would that affect the curry paste? Love your recipes and pictures and books!! Come to DC and do a book signing! I as well as my guys have already been checking out the nice tactics located on your website then then I had an awful suspicion I never thanked the web site owner for those tips. The boys are actually so warmed to see them and have really been making the most of these things. Many thanks for genuinely well thoughtful as well as for choosing these kinds of really good guides most people are really wanting to be informed on. My personal honest regret for not saying thanks to sooner. 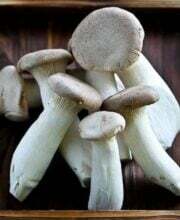 How do you cut up the trumpet mushrooms? slice vertically, then horizontally? Jaden, you suggested that I try this recipe for a green curry. I finally made it tonight. Amazing! I used 3 Tbs of the curry (I’ll probably add another 1-2 TBS in the future), red bell peppers, bamboo shoots, and may add tofu instead of shrimp next time. Thanks for the recipe! My husband said the curry was even better than the one at our favorite Thai restaurant. add 3 TBS oil and, after it’s hot, throw in 1/2 onion and salt to taste. let the onion soften and turn translucent. 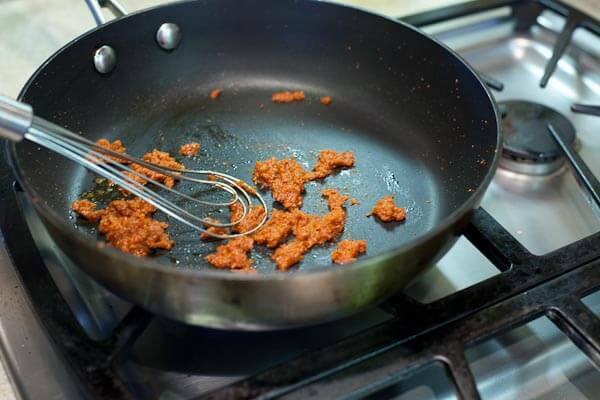 then throw in 2 cloves of minced garlic and minced thai pepper to taste…or if you don’t have thai pepper 1/2 tsp. red pepper flakes. don’t let the garlic burn. when you toss in the curry paste also toss in about 1 TBS of minced garlic. let them bloom together for a few minutes. srsly? 16 thai basil leaves is too precious. you want to really taste the basil….i added a little less than 1/4 cup. as an option, i served this over soba noodles just because i like to slirp. This looks delicious visually. 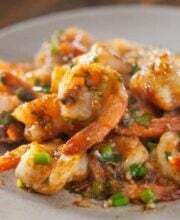 I am a vegetarian and was just wondering if i could substitute the shrimp with some else. Please let me know. I would love to try this out. Btw, how much of a serving does this yield ? Wow, great! I couldn’t find the red paste, so I used the solid block of golden curry I found, I used just a little and soaked a bit in water, it turned out nice anyways. My husband was uber impressed, he has always been too scared to make curry (and he is the chef in the family) and he was just blown away! I was so happy!!! : ) Thank you so much for helping me! I did add your chick pea recipe and it just was AMAZING!!! You are awesome. Thanks so much! Glad you loved recipe. Oh my goodness how did I miss this. Love the coconut and the heat with the shrimp. Not to mention how quick 😉 Ooooo…I can’t wait to make this for my surfer on our next date night. LOVE this! My family loves shrimp and Thia curries. This recipe seemed so simple we decided to make both green and red currie. They were so easy and delicious! I threw in fresh tender green beans into both. I used button mushrooms; next time I’ll cook them separately and drain them before adding to the curry since they added a bit more liquid. 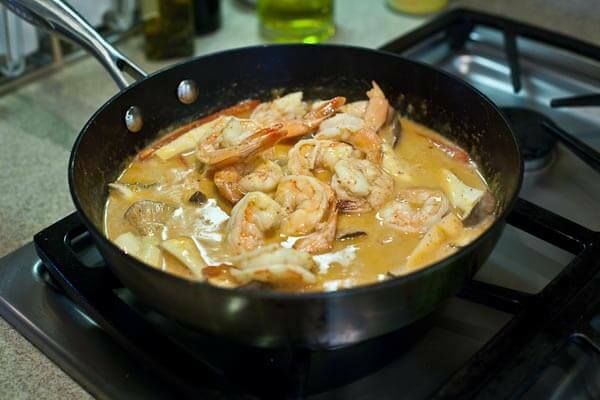 My mom always made curry sauce by making a white sauce and then adding curry powder to taste – I still follow her recipe for curried shrimp, which is basically a big pot of curry sauce with shrimp. I always make a lot because it’s great over sliced hard-cooked eggs on toast for breakfast the next morning. This looks very tempting, though. As I said, I use curry powder, and I’ve also used the bricks (like chocolate bars) from grocery shelves. I haven’t seen canned curry paste, though – is it critical, or can I use one of the other forms? Yes, you can use lite coconut milk. I love everything simple and fast. Yums!! Well, this is going into my favorites file. I made it last night with chicken. It was so fast and delicious. My hubby loves all things curry and raved about this. I’m anxious to try it with shrimp now. Thank you! Thanks so much for this recipe! Didn’t realize how easy it would be to make shrimp red curry. And it was delicious. I now have a new cooking method in my “quiver” thanks to you! Have you ever made it with the lite coconut milk? Wondering if it would alter the taste too much. Also, what lens do you do most of your shots with? Do you think it will alter the flavor if I add Sriracha to make it hotter? Beautifully photographed – looks yummy! Mmm…looks so good! I will have to try this. I’ve never seen King Trumpet mushrooms before, but I want them! I definitely consider curry one of those pantry staple meals, too. Yum! 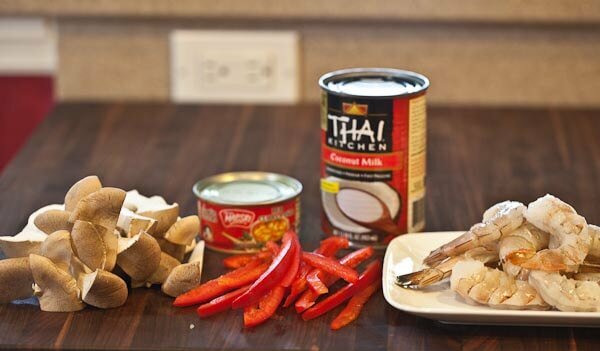 Mmmm, Thai Curry – it’s my “go to” meal too as I always keep cans of coconut milk and curry on hand. There’s a wonderful asian market near me that has a huge selection of both at really great prices. 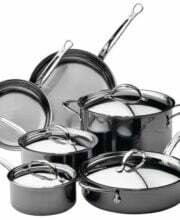 Quick question about the pan you’re using. I’m in the market for new cookware and couldn’t help but notice that your pan appears to be nonstick, yet you’re using a metal utensil. 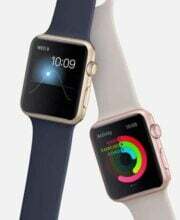 Would you mind telling me what brand itis? 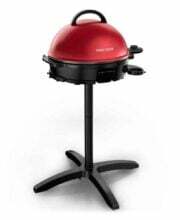 I use ScanPan – it’s nonstick, PFOA free, can use metal utensils and oven safe. You can see it at Sur La Table. I’m usually not a fan of coconut milk, but that looks so good, I don’t think I can pass it up. I hope the taste of coconut isn’t too overpowering. I love it, going to try tonight with chicken. Should you cook the chicken first and then add to the curry? i love canned thai curries, especially the maesri brand. i always have at least 2 types in my cupboard. this looks simple and delicious! I made this tonight. Had seconds it was sooooo delicious. Thanks for such a great recipe Jaden. OMG – I made this for dinner tonight and it was delicious!!!!!!!! Thank you so much for the recipe! Oh my yum, that looks amazing! I think you have single-handedly solved my what-to-make-on-Thursday meal-planning conundrum. I’ve never even heard of King Trumpet mushrooms (wrist slap!). I live in the LA area, do you know where I would be likely to find them? Try Whole Foods in LA! Oh heavenly! This looks absolutely delicious and super easy. I have seen Thai green or red curry paste in a jar, but not in a can…is this an acceptable substitute? 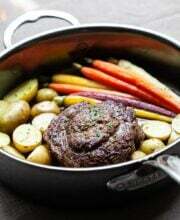 I think I will make this tonight. 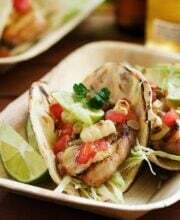 Great recipes and beautiful photography Jaden! Yes! Jarred curry paste is perfect. You can’t beat meals that can be made in 10 minutes from pantry items. Curry dishes are always a hit with the family. Colorful and spicy. Delightful dish! This looks fantastic, and the fact that it is simple-what a bonus! Jaden-do you think I could substitute chicken for the shrimp? Thanks! yes you can – slice the chicken into thin strips and let cook for a few minutes longer to cook through. I love this inherently gluten free meal! It’s one of my easy go-to choices for nights that don’t leave a lot of time for cooking. As much as I like Thai food, I’ve only ever had Indian curry. That has to change shortly. This looks absolutely delectable. I seriously can’t wait to make it. Think you could rehydrate dried shitake mushrooms for this? I ALWAYS have Thai curry and coconut milk on hand. Don’t know why this kind of thought process doesn’t automatically leap into action when I am in an “emergency” situation! Maybe if I re-read this post a few times, it’ll stick. LOL! Yes you can use dried & rehydrated shiitake mushrooms! Thanks for stopping by my site, I’m glad you enjoyed the photos! 🙂 Love this quick recipe, and those mushrooms you used…are my favorite! Eringi mushrooms are kind of pricey here on Oahu though, but so delicious! HHMMMM! 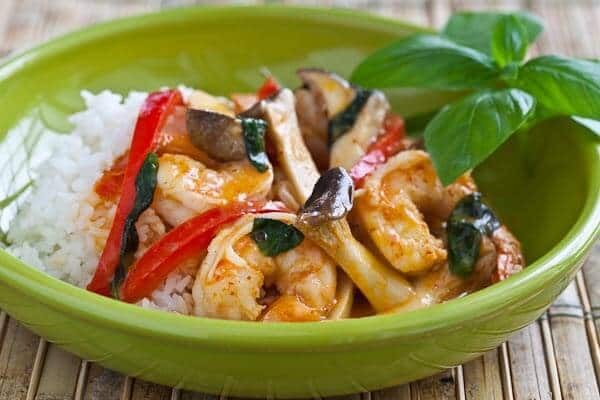 I have all the ingredients for this…any thing with the works Thai, shrimp and curry in the recipe title has got to be Delicious! Can’t wait to try it. I started following your blog since I found it at the list of the best cuisine and gastronomy blogs. I follow your updates daily by google reader. I love the way you post the recipes, with photos of all the dish prepare. Your recipes are very nice. All the best for you. Thank you for sharing this with us. My english isn`t very good. I`m from Brazil and I have a food blog too. Oh this is so up my alley… I will have to give the Mae Ploy brand a try. I’ve been using Thai Kitchen brand and it’s really not all that great. This is my go-to meal, also. I always have frozen shrimp or boneless, skinless chicken breast on hand, and often have blocks of tofu, too. Almost any vegetable will do, though peppers and snap peas or green beans are particularly good. A really perfect pantry always has coconut milk and curry pastes! You had me at 10-minute. Actually, like you, Thai curry is often my go-to meal when I need something quick and delicious. I don’t cook the curry paste first before adding the coconut milk though–that’s a good tip! Thanks! What a great recipe! I will always have the curry paste and coconut milk on hand so I can make a quick curry in a pinch. This is a great way to use up veggies in your fridge too. Thanks! Do you order the mushrooms from this company-shipped fresh or do you find these locally? I do not see any part of the website to actually place an order or prices. Love all the sites I have discovered in reading yours! Thanks. 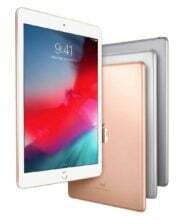 I think they’re for sale all over California and they are working to get distribution across U.S. 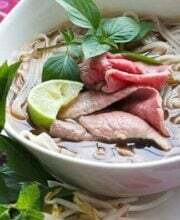 I miss miss miss Asian food on your site!! Jaden to the rescue! I made a Thai chicken curry last week that my wife and I loved. 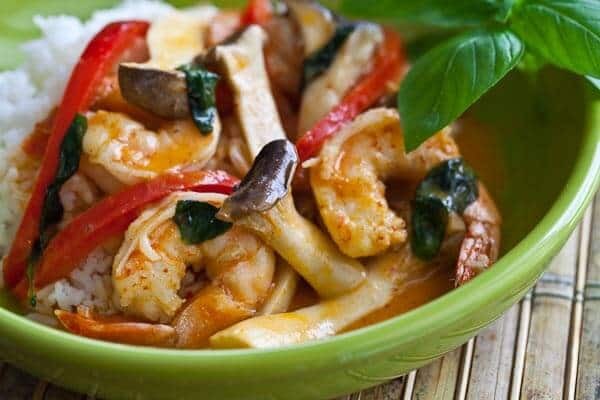 I swear today I had shrimp on the brain and viola…up pops this mouthwatering picture of your Thai shrimp curry. I have everything on hand and I can’t wait to make it this weekend! Now I have a serious craving for curry. This beats waffles any day of the week for a quick meal! Oh my goodness does that just look beautiful and tasty or what?!! I adore curry and can’t wait to try this one. 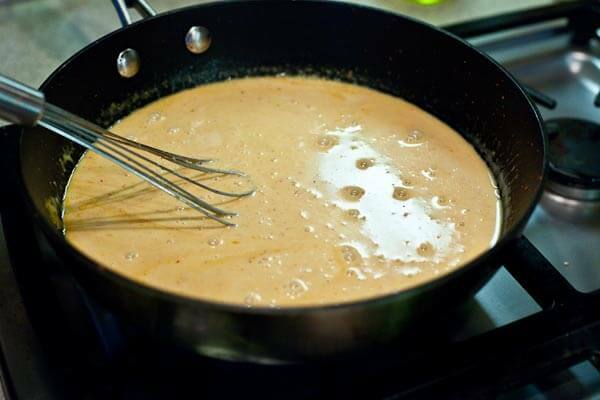 The sauce looks beautifully creamy and I’m thinking I’d like to give it a try with some chicken instead of shrimp. thanks for reminding me about thai curry pastes! I love in particular, green curry. MMM! I can’t wait until my girls are older so they can tolerate eating hot stuff! 10 minutes! Sign me up! My boyfriend would be over the moon about this quick dish — I’m going to email it to him right now! I need to get some curry paste. I’ve made curries, but I guess just Indian style. Good to know the difference and thanks for the great recipe! Jaden, this is better than Rachel Ray…10 minutes for a delicious Thai meal! You’re the best! Oh gosh, that looks soooooo goooooooood. Wow, that looks very easy to make. 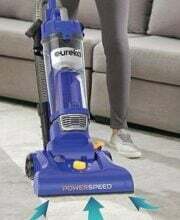 I am going to try it soon. Thanks for the recipe! Your recipe (and photos!) look amazing. I have several different types of curry powders, but no curry paste. 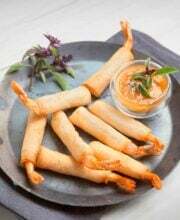 Can you advise how this recipe could be modified to use curry powder rather than the paste? I may never be allowed back in Steamy Kitchen land again, but I have never had curry. I know, what is wrong with me? awww…you’re always welcome here! this is a simple way to try curry!